Sulphur Grove Tool is a family business that was founded in 1992 by Ohio native and woodworker Bill Daniel. In 2011 Bill retired and the company moved to Jacksonville, Florida. Sulphur Grove Tool is still owned and operated in the Daniel family by his son Rick with the same tradition of quality and customer service our customers have come to expect. 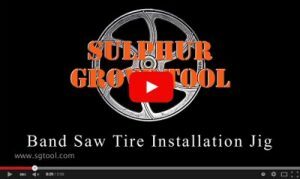 Sulphur Grove Tool supplies the woodworking community with tools and accessories with a focus on products that make your woodworking experience even better. In 2001 Sulphur Grove Tool started manufacturing Urethane Band Saw Tires from 100% U.S.A supplied material. Over a decade later we are manufacturing the best quality replacement tires for nearly every brand band saw out there including hard to find tires for the hobby bench-top saws or large professional, commercial and industrial equipment. We have manufactured tires for customers such as NASA, Universal Studios, US Navy, US Army, FBI, GM, Universities, High Schools, Woodworking Clubs, Professionals and Hobbyists all over the world. Sulphur Grove Tool is also an authorized distributor for a number of industry manufacturers such as Fenner Drives, Olson Saw, JET, Powermatic, Wilton, Rikon, Shop Fox, Ronan, and Ridge Carbide. We will always be adding to our product line.